Acknowledged author wrote ESSENTIALS OF ACCTG FOR GOV & NOT-FOR-PROFIT ORG 13 comprising 448 pages back in 2016. Textbook and etextbook are published under ISBN 125974101X and 9781259741012. Since then ESSENTIALS OF ACCTG FOR GOV & NOT-FOR-PROFIT ORG 13 textbook received total rating of 4 stars and was available to sell back to BooksRun online for the top buyback price of $68.50 or rent at the marketplace. 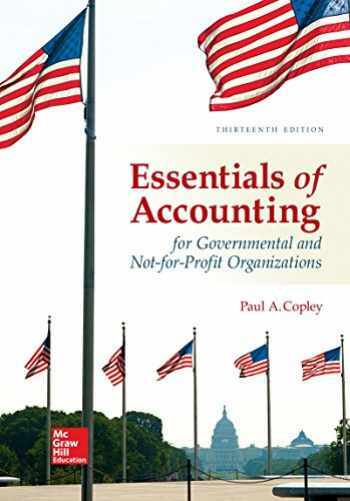 Copley's Essentials of Accounting for Governmental and Not-for-Profit Organizations, 13e is best suited for those professors whose objective is to provide more concise coverage than what is available in larger texts. The main focus of this text is on the preparation of external financial statements which is a challenge for governmental reporting. The approach in this edition is similar to that used in practice. Specifically, day to day events are recorded at the fund level using the basis of accounting for fund financial statements. Governmental activities are recorded using the modified accrual basis. The fund-basis statements are then used as input in the preparation of government-wide statements. The preparation of government-wide statements is presented in an Excel worksheet. NEW for the 13th edition is McGraw-Hill Connect, a digital teaching and learning environment that saves students and instructors time while improving performance over a variety of critical outcomes.